Breaking Down Inspire Courage, MinMax Boards Handbook Edition! Optimized Dragonfire Inspiration is pretty much like this. Christ: He has been ever-vigilant, ever-faithful, and ever-good to me. Sometimes, I realize it and thank Him for it. Here You go! Contributors to the Non-Handbook Edition: So much is in here because of you! Updated the links section with an ENWorld post. Updated Dragonfire Inspiration again with a link to Dragontouched so you don't need Sorcerer levels. I knew there was something like this! Updated Dragonfire Inspiration with a link to Draconic Heritage, and mentioned that Draconic Heritage normally requires a Sorcerer level. The prereq is ick, but thanks to Mixster for mentioning that. -Warrior Skald: Added this to the list. It rocks for a level and becomes less useful for Bard-types afterward..
-Song of the Heart: Clarified that skipping prereqs on bonus feats is a debatable topic. -Added Eberron Campaign Setting's Bonus Feats for Bards. Initial release. I thought I could update the original thread in 30 minutes. It instead took about 4 hours. For our purposes, I mostly care about getting bonuses to accuracy ("attack") and damage with a Bard's Inspire Courage. I know there are threads on this, but they lack math and the above image. The focus of this thread is for 3.5. Pathfinder Bards benefit from most the same material, but have a slightly different Inspire Courage progression and slightly different rules for Bardic Music. A Bard with 3 or more ranks in a Perform skill can use song or poetics to inspire courage in his allies (including himself), bolstering them against fear and improving their combat abilities. To be affected, an ally must be able to hear the bard sing+. The effect lasts for as long as the ally hears the bard sing+ and for 5 rounds thereafter. An affected ally receives a +1 morale bonus on saving throws against charm and fear effects and a +1 morale bonus on attack and weapon damage rolls. At 8th level, and every six Bard levels thereafter, this bonus increases by 1 (+2 at 8th, +3 at 14th, and +4 at 20th). Inspire Courage is a mind-affecting ability. +This really should be "notice the Bard perform," especially for tap dancing or miming. BARD LEVELS: +1 @1, +2 @8, +3 @14, +4 @20. You can usually get by with 1-4 Bard levels and Inspire Courage enhancers. Dread Pirate Levels (Complete Adventurer 39): +1 and 1/day @3, +2 and 2/day @7. Honorable Dread Pirates effectively get Inspire Courage (usable as a free action) that stacks with Inspire Courage. Becoming a Dread Pirate is impractical for a typical Bard, though. Dread Pirate requires being NG/CG/TN/CN/NE/CE, +4 BAB, 8 Appraise ranks, 8 Profession: Sailor ranks, 4 Swim ranks, 4 Use Rope ranks, the feat Quick Draw, the feat Weapon Finesse, and your ownership of a seaworthy ship worth at least 10,000G. Phew! Heartfire Fanner Levels ("Dragon 314" 23): @1: Gain Bardic Music as a Bard5 or stack with existing ability. @3 you can give someone else (no, not you) +2 accuracy and AC while Inspire Courage lasts. Heartfire Fanner requires 10 Diplomacy ranks, 10 Perform ranks, the feat Negotiator, the feat Skill Focus: Perform, the ability to cast level 1 spells, and you "[must] be a member of an organization that inspires as part of its dogma." Short circuit that last requirement by founding your own one-member (or adventuring group-wide) organization with the name, "Inspirer(s)." Incantatrix Levels (Player's Guide to Faerun 61): @3 you get Metamagic Effect which applies to "a persistent spell effect that is already in place." This applies to a lot of effects, but not, by RAW, to supernatural (Su) effects, which Bardic Music is. If your DM lets you, then with Persistent Spell and a high enough Spellcraft check you can make your Inspire Courage last all day, and Extend it too! Even if you can't increase the duration of Bardic Music, this can make you an excellent support character! Incantatrix requires 4 Concentration ranks, 8 Knowledge: Arcana ranks, 8 Spellcraft ranks, the feat Iron Will, a metamagic feat, the ability to cast level 3 arcane spells, and the ability to cast Abjuration spells. Once in, you must forbid one school of magic like a Wizard does. Debatably, this means you can keep the spells you know of your opposed school, but can't learn new ones. Ask your DM. Mythic Exemplar Levels (Complete Champion 86): Gain Inspire Courage as Bard of Mythic Exemplar level. Mythic Exemplar and Bard levels stack for Inspire Courage bonuses. NOTE: Only followers of Sir Reikhardt gain this benefit. Mystic Exemplar has a buncha ways to enter. Ahem. Skills: 3 Knowledge: History ranks AND 7 ranks in any one of these: Diplomacy, Intimidate, Knowledge: Arcana, Knowledge: Religion, Move Silently. Special: ONE of these: +5 BAB, able to cast 3rd-level spells, sneak attack +2d6, or ability to grant allies a bonus on attack rolls, saves, or checks as an extraordinary ability. Special: Must be a member of the Disciples of Legend. Seeker of the Song Levels (Complete Arcane 56): @2 you can play two Bardic Musics simultaneously. Go go Inspire Courage and Dragonfire Inspiration, or 2 types of Dragonfire Inspiration! If you're also a War Chanter5, you should be able to play 3 songs simultaneously. Ask your local DM. Seeker of the Song requires 13 Knowledge: Arcana ranks, 13 Perform ranks, the feat Skill Focus: Perform, having Bardic Music, and hearing another Seeker of the Song perform its class-granted music abilities. Ask around Very Big Cities™ to find such a person, or make a simulacrum of this Seeker and listen to it perform. Virtuoso Levels (Complete Adventurer 89):Virtuoso grants a weaker Bardic Music as an equal-level Bard, but only gains fascinate (@1) and some unique songs later. Sadly, Virtuoso doesn't grant Inspire Courage. Virtuoso and Bard levels stack for all Bardic Music effects and uses. Virtuoso requires 4 Diplomacy ranks, 4 Intimidate ranks, 10 Perform ranks, and an arcane caster level of 1 or higher. War Chanter Levels (Complete Warrior 87): @5 you can play two Bardic Musics simultaneously. Go go Inspire Courage and Dragonfire Inspiration, or 2 types of Dragonfire Inspiration! War Chanter requires more levels for its dual songs, but gets this ability sooner. If you're also a Seeker of the Song2, you should be able to play 3 songs simultaneously. Ask your local DM. War Chanter requires being NG/CG/TN/CN/NE/CE, +4 BAB, 6 ranks in Perform: Oratory OR Perform: Sing, the feat Combat Expertise, the feat Weapon Focus, and Bardic Music. Warrior Skald Levels (Races of Faerun 187): @1 you get access to ALL standard Bardic Music abilities if you have the requisite Perform ranks and Warrior Skald and Bard levels stack for daily Bardic Music uses. Bring on Inspire Courage and Inspire Greatness! Warrior Skald1 also grants proficiency with all simple/martial weapons, all armor, and all shields. It's a full BAB class with a good Fort save and a good Reflex save. Booyah! Warrior Skald is mostly meant to turn a warriorly non-Bard into a Bard. The first level is truly the best, especially if more modern classes like Sublime Chord (Complete Arcane) and Jade Phoenix Mage (Tome of Battle) are available. The prereqs are pretty lenient as well. A typical melee man is expected to have Power Attack and Cleave. In these modern times, getting 6 Concentration ranks is handy for Diamond Mind maneuvers. The prereq of 9 Perform ranks (Poetry, Any Other) is confusing, but has been clarified elsewhere to mean, 9 ranks in Perform: Poetry. Warrior Skald requires 6 ranks in Concentration, 9 ranks in Perform: Poetry, the feat Cleave, the feat Power Attack, and perhaps a DM into Beowulf. Paladin1 (Champions of Valor Web Enhancement): +1 @1 and only while singing. Harmonious Knights lose their detect evil ability ("evildar"). Unlike most Bardic Music analogs, this + does not improve and does not explicitly stack with other levels for the total Inspire Courage bonus. So yeah. At least the number of daily uses is based off your Paladin and Harmonious Knight levels. 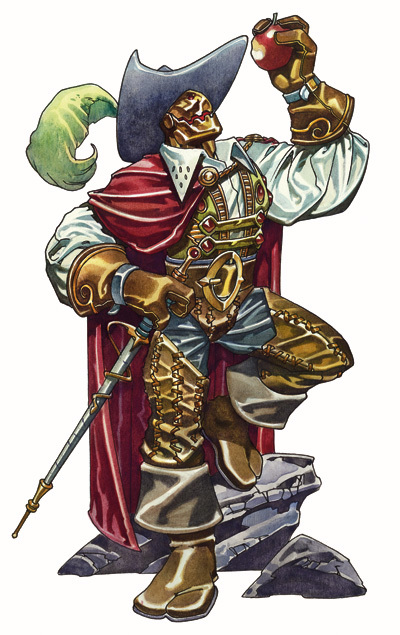 Hopefully your DM will let this Harmonious Knight Inspire Courage stack with a Bard's and improve like a Bard's. I'd allow it. Remember, Bardic Music uses the term "sing" instead of "perform." I don't know why they did this. From Smite to Song Feat (Champions of Valor 29): A Paladin may convert a Smite Evil attempt into Inspire Courage with a "Bard" level equal to his Paladin level. (Assumedly, Bard and Paladin levels stack for the total bonus.) Perform becomes a Paladin class skill and your DM wonders why your class went up a tier. Initiate of Milil Feat (Champions of Valor 31): Your Paladin, Cleric, and Bard levels stack for determining "which kinds of Bardic Music you can use." This phrasing implies I can go Bard2/Cleric6 and get Inspire Courage +2. Maybe I can even go Cleric8 and get Inspire Courage +2. Considering I could instead go Cleric of Mystra3 for the ability to cast in no magic zones, getting a slightly higher Inspire Courage + seems balanced. Song of the White Raven Feat (Tome of Battle 32): Crusader and Warblade Levels stack with Bard levels to determine Inspire Courage's +. Debatably also grants extra Bardic Music uses per day, if only for Inspire Courage. Finally, you can activate Inspire Courage as a swift action if in a White Raven stance, but most likely you'll use your swift actions for inspirational boost and a Badge of Valor. Ask your DM if PrCs that grant access to White Raven maneuvers also count for this feat. It ain't in the rules, but I'd like Eternal Blade, Master of Nine, and Ruby Knight Vindicator levels to stack as well. *Dragonfire Inspiration Feat (Dragon Magic 17): Doesn't give a straight +, but does d6 fire damage per Inspire Courage +. You can get Dragonfire Inspiration for a Pyroclastic Dragon. This damage becomes fire or sonic. Casting the creaking cacophony spell (Spell Compendium 55) on your foes gives them sonic vulnerability (+50% sonic damage) with no save. Dragonfire Inspiration's energy damage stacks with normal Inspire Courage but normally requires another Bardic Music use to activate. The above requires a Sorcerer level, the Dragontouched feat, or a lenient DM who lets you just take Draconic Heritage or ignore the feat tax. Pyroclastic Dragon stats are found on Draconomicon 182. Racaes of the Dragon 103 has a list of dragons with their breath weapon damage type. Lingering Song Feat (Complete Adventurer 111): Your Bardic Music lasts for 1 minute (10 rounds) after you stop performing instead of 5. Song of the Heart Feat (Eberron Campaign Setting 60): +1. Other feats get bonuses too, but those don't matter for our purposes. Nyah. Eberron Campaign Setting 34 states a Bard may take this feat in place of a new form of Bardic Music at level 3, 6, 9, 12, 15, or 18. Since these are "bonus feats," you can debatably skip the prereqs. If you can, then in short, you can dump Inspire Competence to take this and, say, Dragonfire Inspiration at level 3. Words of Creation Feat (Book of Exalted Deeds 48): DOUBLES your Inspire Courage bonus with any instrument. Saner interpretations say this is only from levels, but RAW says 'doubles.' You also take icky subdual damage unless you're immune. Hello, undead Bard! You can use Words of Creation to enhance Bardic Music. A Bard who has the Words of Creation feat can use these powerful words to enhance his Bardic Music ability as detailed below. When a bard uses the Words of Creation in this manner, it is extremely draining, and the bard takes 1d4 points of nonlethal damage for each rank in Perform required to produce the Bardic Music effect he is enhancing. (You suffer this damage on activation, not per round.) For example, if Jack Black uses the Words of Creation to double an Inspire Courage effect (minimum 3 ranks in Perform), he takes 3d4 points of nonlethal damage. For Inspire Courage, double the morale bonus on saving throws against charm and fear and the morale bonus on attack and weapon damage rolls (+2 at 1st level, +4 at 8th level, +6 at 14th level, +8 at 20th level). Inspirational Boost (Spell Compendium 124): +1 on next Inspire Courage started within 1 round. Spell Compendium 6 overrides the old spell harmony from Magic of Faerun and Player's Guide to Faerun. Badge of Valor Item (1400G, Magic Item Compendium 208): +1 on current Inspire Courage. Activate immediately after the round you use Inspire Courage. Vest of Legends Item (16,000G, Dungeon Master's Guide II 272): Your Bardic Music is treated as being 5 levels higher. (There are some other, less important effects.) Non-Bards debatably gain a Bard5's Bardic Music abilities, including Inspire Courage +1. Masterwork Horn, Natural [Wind Instruments] (100G/3 lb, (Song and Silence 46): +1 on accuracy/damage, -2 on fear saves. Put a thin cord through this horn and hang it from your neck. Nothing in the rules states you must use your hands for this. Hold the horn with enough of your teeth to keep it in your mouth and speak with the rest of your mouth! Masterwork Instrument: 100G/3lb1: The rules as written say that all masterwork instruments cost 100G, and for a Medium creature, weigh 3lb. 1This weighs double for Large creatures and half for Small creatures. Alphorn [Wind Instruments] (Song and Silence 42): Inspire Courage, Inspire Greatness, and Countersong can affect people for d10 miles. Yes, miles. MASTERWORK HORN, NATURAL [Wind Instruments], (Song and Silence 46): +1 on accuracy/damage, -2 on fear saves. Put a thin cord through this horn and hang it from your neck. Nothing in the rules states you must use your hands for this. Hold the horn with enough of your teeth to keep it in your mouth and speak with the rest of your mouth! This is the instrument of choice for Inspire Courage. Lute [String Instruments] (Complete Adventurer 126): You get +1 effective Bard level for Bardic Music. Debatably, this lets non-Bards use Inspire Courage 1/day as a Bard1. If this works, you've replaced the best part of a class with a 100G nonmagical item and 3 Perform ranks! You can also cast spells while using Bardic Music if these spells have no somatic or material components and no focuses. Bagpipes [Wind Instruments] (Song and Silence 42): Everyone who hears this gets -1 on saves vs. fear. Scaring people this way is a supernatural mind-affecting ability. Drum [Percussion Instruments] (Complete Adventurer 124): +1 damage, -1 saves vs. charm & fear. Fiddle [String Instruments] (Complete Adventurer 124): +1 (+1 more with dance) on saves vs. charm & fear. Can also cast spells while using Bardic Music if these spells have no somatic or material components and no focuses. Flute [Wind Instruments] (Complete Adventurer 125): +2 on Countersong checks. Yeah. Right. Harp [String Instruments] (Complete Adventurer 125): You can affect 1 more target with fascinate and Inspire Greatness. Can also cast spells while using Bardic Music if these spells have no somatic or material components and no focuses. Horn [Wind Instruments] (Complete Adventurer 126): +1 damage, +1 saves vs. fear. Bardic Music lasts only 1 round after you finish playing instead of 5. The Lingering Song feat (Complete Adventurer 111) should override this, meaning Bardic Music lasts for 1 minute (10 rounds) instead of the piddly 1. Lyre [String Instruments] (Complete Adventurer 126): You can affect 1 more target with fascinate and Inspire Heroics. Can also cast spells while using Bardic Music if these spells have no somatic or material components and no focuses. Mandolin [String Instruments] (Complete Adventurer 126): +1 accuracy, -1 saves vs. charm & feat. Can also cast spells while using Bardic Music if these spells have no somatic or material components and no focuses. Eberron Campaign Setting 34 lets you trade a Bard song like Inspire Competence for a "bonus feat" from the select list. Sometimes, you can skip the prereqs of a bonus feat. Here, it's uncertain. I support the notion of bypassing feat prereqs in this case. It gives a slight incentive to stay Bard and the feats gained aren't that powerful. Besides, doing this lets me take Dragonfire Inspiration and Song of the Heard at Bard3. If you have the uses of Bardic Music, can you maintain various Inspire Courage effects? For example, can you play cymbals, sing, tap dance, play bongos, and fart out a horn for stacking bonuses to Inspire Courage? If so, you'll probably look incredibly silly, but when your allies get quintuple the Inspire Courage bonus, you can watch your foes bleed! Second, let's assume I have 4 ranks in Perform: Wind Instruments, but no other Perform ranks. Can I use Inspire Courage with another instrument, like singing? The rules aren't clear on this, but suggest I can. Ask your DM. Promise him it'll be entertaining, in and out of character. War Chanter + Seeker of the Song = 3 Simultaneous Bardic Musics? If I'm a Seeker of the Song2 (Complete Arcane 56) and War Chanter5 (Complete Warrior 87), can I play 3 Bardic Musics at once? I seemingly can. What does Words of Creation double? The Words of Creation Feat (Book of Exalted Deeds 48) DOUBLES your Inspire Courage bonus with any instrument. Saner interpretations say this is only from levels, but RAW says 'doubles.' You also take icky subdual damage unless you're immune. Hello, undead Bard! Does Dragonfire Inspiration of the same energy type stack? Second, the energy damage type (fire, sonic, etc.) has no name. Most bonuses have names, like morale or dodge. On the other hand, the damage comes from the same source, either the same performer or different performers with the same feat. How does Initiate of Milil affect Inspire Courage? The Initiate of Milil Feat (Champions of Valor 31) states that your Paladin, Cleric, and Bard levels stack for determining "which kinds of Bardic Music you can use." This phrasing implies I can go Bard2/Cleric6 and get Inspire Courage +2. Maybe I can even go Cleric8 and get Inspire Courage +2. Do Bardic Music level enhancers apply to Inspire Courage from non-Bard sources? If, however, you gain Bardic Music through some other means, such as Dread Pirate or Heartfire Fanner, do those levels count? I believe they should, but ask your GM. The same logic applies to the 100G Lute (Complete Adventurer 126) . Re: Breaking Down Inspire Courage, MinMax Boards Handbook Edition! Updated with more info from ENWorld.